They shine even from billions of light years away. Intriguing and enigmatic, quasars are loath to uncover their secrets. Fortunately, we can find out more about them by looking at their star counterparts - microquasars. 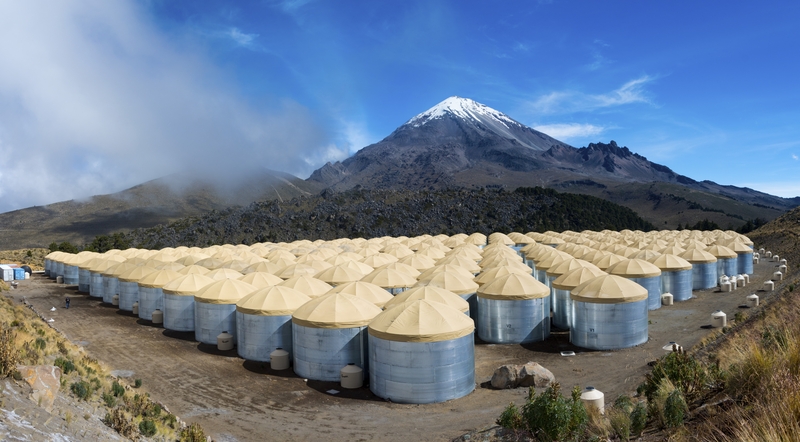 Many years of observation of the microquasar SS 433, carried out in the HAWC observatory, have made it possible to identify, for the first time, spectacular details of the processes responsible for the production of high-energy radiation. This is probably one of the most majestic views a man could ever see. Just next to a gigantically bloated, blindingly bright star lurks a voracious ball of "nothingness": a black hole that scrupulously engulfs the matter from its shining companion. These particles, falling to the horizon of events, form a flat whirlpool, part of which flows towards the axis of rotation of the black hole. From both poles, narrow jets of matter shoot in opposite directions. Collimated by the invisible claws of magnetic fields, like a giant's hairpins, they pierce the abyss of the cosmos, breaking off on the expanding shell of matter surrounding the system - the remnants of a supernova explosion. Welcome to the world of the microquasar SS 433, in recent months one of the main objects of interest of the High-Altitude Water Cherenkov Observatory Gamma-Ray Observatory (HAWC). Quasars, active galactic nuclei, are some of the most unusual and at the same time brightest objects in the Universe. The driving force of a quasar is the supermassive black hole found at its centre, surrounded by an accretion disk formed by falling matter. Quasars are sources of extremely intense electromagnetic radiation, covering almost the entire spectrum, from radio waves to high-energy gamma rays. Being a type of galactic nucleus, quasars are by definition distant objects. The nearest quasar Markarian 231, powered by a pair of supermassive black holes madly spinning around each other, is in the nucleus of a galaxy 600 million light years away. This is not a distance that is conducive to carrying out high-resolution observations to facilitate an understanding of the nature of the processes taking place here. "Both quasars and microquasars can generate jets, that is, very narrow and very long streams of matter, emitted in both directions along the axis of rotation of the object. The jets are created by particles accelerated to speeds not infrequently close to the velocity of light. In terms of speed, the jets from SS 433 are not particularly impressive: they reach only 26% of the velocity of light. What is more important is something else," says Prof. Sabrina Casanova (IFJ PAN), and elaborates: "Most of the observed quasars have jets that are to a greater or lesser degree directed towards us. This orientation makes it difficult to distinguish details. On the other hand, SS 433 was kind enough to direct its jets not towards us, but almost perpendicular to the direction in which we look. Therefore, not only do we have the object almost at hand, it is also optimally positioned when it comes to observing details such as the sites from where the radiation originates." "That's not the end of the surprises. Gamma photons with energies of 25 TeV have to be produced by particles of even higher energies. These could be protons, but then they would have to have enormous energies at a level of 250 TeV. The data we collected, however, showed that this mechanism, even if it actually works, is not able to generate the right amount of gamma radiation in the case of SS433," explains Dr. Francisco Salesa Greus (IFJ PAN). 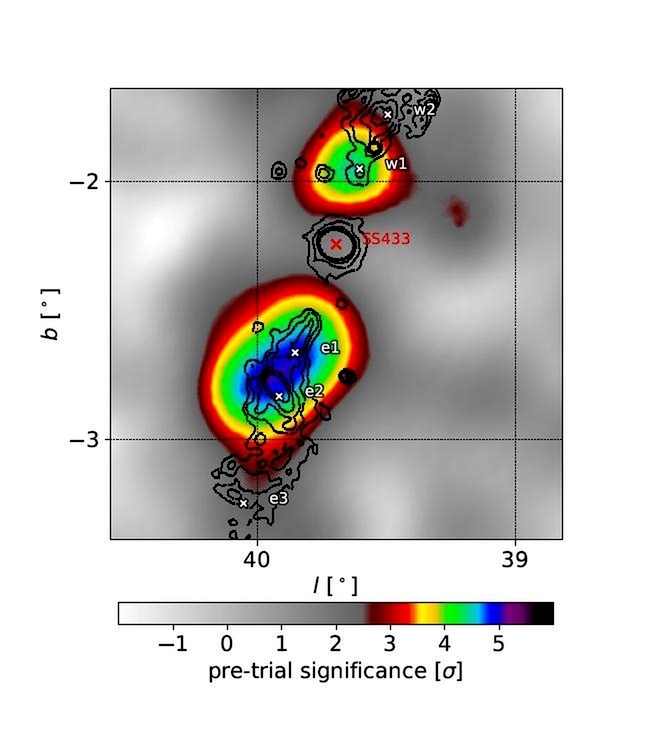 In further work, data from HAWC were compared with SS 433 measurements in the remaining spectral ranges from other observatories. In the end, it was established that high-energy gamma quanta - or at least the majority of them - have to be emitted by electrons in the jet during their collisions with the low-energy microwave background radiation filling the entire cosmos. The above mechanism, described here for the first time, could not have been detected in observations of quasars with jets directed towards Earth. SS 433 has thus helped to reveal not only its own secrets, but also the secrets of the brightest lanterns of the Universe. "Very high energy particle acceleration powered by the jets of the microquasar SS 433"